University of New Brunswick alumnus Allan Kember is making history in the medical world with his new product that has the potential to reduce the number of low birth-weights and stillbirths in developing countries. Kember has created a device that lessens the amount of time women sleep on their backs during pregnancies. The device is called the PrenaBelt and was awarded funding from the Grand Challenges Canada’s Stars, which is funded by the Government of Canada, in the Global Health program for its bold idea and beneficial health impacts. 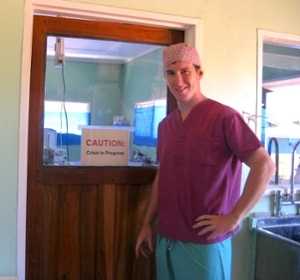 Kember (BScME ’12), who is now attending medical school at Dalhousie University, didn’t think he would become a doctor until going on a volunteer mission to Zambia as a UNB engineering student in 2009. After researching reasons contributing to stillbirths and low birth weight, Kember found numerous studies demonstrating that pregnant women who sleep on their backs were more likely to face these issues. Lying on the back during pregnancy can compress one of the major veins returning blood to the heart, and it is thought that this, in the presence of some additional vulnerabilities, may reduce the levels of nutrients and oxygen being supplied to the developing baby. The product will hopefully help prevent future stillbirths and low birth-weights in not only developing countries but on a global scale as well. The third prototype of the PrenaBelt has recently been developed and will be tested this year in studies in Australia, Canada, and Ghana to determine its effects on sleep and pregnancy outcomes. Kember says there’s still much work to do before women are using this device; however, the possibilities once it is finished could be medically substantial. Kember graduated from UNB’s Mechanical Engineering program in 2012 with notable achievements. He was granted the Currie Scholarship, which is an award granted to only four students per year from the Atlantic Provinces who portray leadership capabilities in either school and/or extracurricular activities. He is not only entrepreneurial, but also exceptionally brilliant; he graduated at the top of his class for all of UNB and was presented the Governor General Silver medal. Kember claims that he had chosen UNB for the scholarships initially and knows he made the right choice. He says that UNB is where he met some of his closest friends along with making very fond memories. He says he owes much of his success to his family for the love, care, and direction they have given him over the years; and Dr. Richard Currie and his team for his support and inspiration since 2007. See more about Allan and what he does here.